Get ready for some birthday fun for your baby!!! 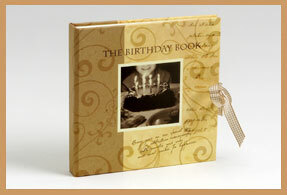 The Birthday Book is where's it's at to start your memories right! you can keep on great photo of your child form each and every birthday up to age 21. The book folds out so it's easy to see the changes from page to page!! To make it really fun, the makers suggest that you use the same outfit for each year. Choose one of dad's high school outfits, or mom's ballet performance, grandpa's cowboy hat and boots or a family heirloom. Choose something that will be good to grow into for all 21 pages and 21 years! We love this idea and we love The Birthday Book! It's hand-bound and made of the highest quality acid-free papers.